Suppose you’d never been to an opera. That was me just a few weeks ago. Then I won a ticket to see any Santa Fe Opera performance I wanted. A big fan of composer Richard Strauss, I chose Salome. After having heard from friends how beautiful the whole Santa Fe Opera experience was, I couldn’t wait to go. I drive into the parking lot and notice the zest in which Santa Fe Opera people party. They dress like it’s New Year’s Eve and feast around fancy table set ups like its Thanksgiving dinner. I enter the opera house for my very first time. It’s other-worldly. What a beautiful structure. Streamlined, clean. Comfy seats. When the house lights dim, a setting sun – as seen through the opera house’s open back-end – turn set pieces into majestic silhouettes. Lights return, exposing a sparse but beautiful set. Then, performers appear. They start talking, er, singing. That’s when the party ends. Hearing a ton of German sung on stage, I constantly check subtitles posted on the chair back in front of me. I read Salome’s words, but only hear a song fest. It’s taking some getting used to, but I try to get into the swing. Fifteen minutes through the production, characters still talk about the same thing they were talking – er, intoning – fifteen minutes ago when the show began. Not only that, but they’re prompting subjects that never come up in normal conversation (let alone ones people might sing about in public if so inclined). 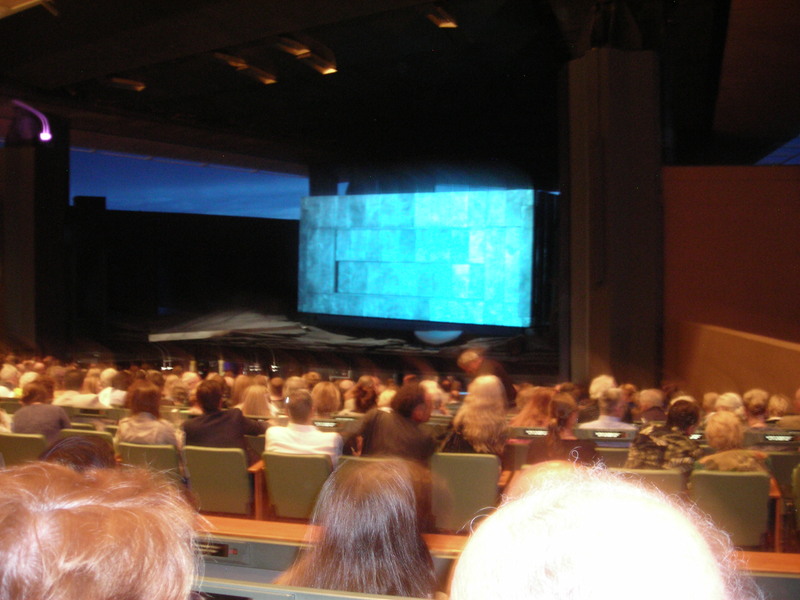 The huge box that centers the stages slowly rotates 180 degrees to expose a new set containing a man sitting at a table in the middle of a room. He barely moves. A woman circles the area, pontificating about his nose. I check the time on my watch. Fifteen minutes later, the man is still serenaded to, but the woman changes the topic to a musical discussion about his lips. Apparently, she likes him? It is here I believe a love story has entered the opera, but I’m not sure. Four more watch-check intervals later, the woman holds up the man’s bloody head for all to see. She’s even performed a risqué dance in honor of the severed orb. Then the opera is over. That’s it. The guy behind me stands, yelling “Bravo!” Seconds later, the rest of the audience stands. What did I miss? I glance at my ticket stub and the $118 price. What? This seat is pretty far back and way to the right. You see, for better or for worse, this is how I see opera. I come from a generation steeped in television and movies where no one sings instead of talking to each other. Tonight, thousands attended Salome after waiting all year to experience its glory. Authors of the Bible, Oscar Wilde, Richard Strauss, even Al Pacino, have been captivated by Salome’s story, so what happened to me? Perhaps I should never have left the parking lot’s fine dining experience. It all comes down to this: When a guest suddenly sings across the table to me, “Please pass the salt,” I immediately get the urge to be excused from my own dinner party to go watch TV.